As if the gods are screwing with us, the post immediately after the world’s greatest Firestone Squigglies poll turns out to be a bike that looks so good wearing the things, there ought to be a law against it. Meet one of Moto Guzzi’s lesser-known creations; the weird little brother of the V7 who doesn’t speak much and likes to set things on fire… the V35 C. In original “C” form it was, believe it or not, a cruiser (Harley Davidson – so much to answer for). 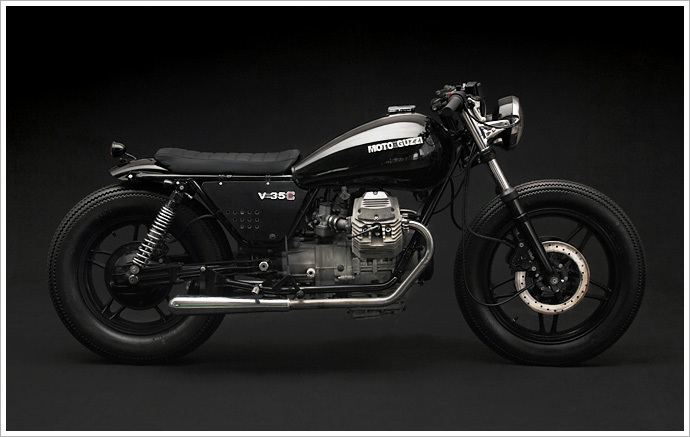 But thanks to NYC’s Stefano Venier and his shop Venier Customs Motorcycles, it’s no longer a lardy 80s misfit, but rather a lean, mean ridin’ machine. Which still starts fires.